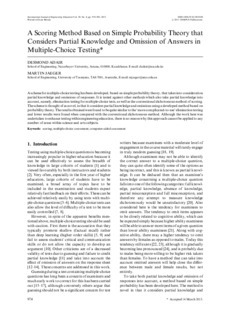 A scheme for multiple-choice testing has been developed, based on simple probability theory, that takes into consideration partial knowledge and omissions of responses. It is tested against other methods which also take partial knowledge into account, namely, elimination testing for multiple-choice tests, as well as the conventional dichotomous method of scoring. The scheme is thought of as novel, in that it considers partial knowledge and omissions using a developed method based on probability theory. The results obtained were found to be quite similar to the ‘more-complicated-to-use’ elimination testing and lower results were found when compared with the conventional dichotomous method. Although the work here was undertaken to enhance testing within engineering education, there is no reason why this approach cannot be applied to any number of areas within science and arts subjects.